At our March 15th meeting, Jonas Dupuich brought an almost academic air to the gathering. We could have been sitting in an art or design class for all the discussion of angles, flow, and form. After a demonstration of formality using a collection of stands, the audience was riveted by Jonas’ slideshow of some Japanese show displays. Jonas posed a couple questions throughout, and the audience had a host of questions of their own. It was all very analytical as we all sharpened our artistic sensibilities, engaged by the display scenarios and comparisons presented by Jonas. 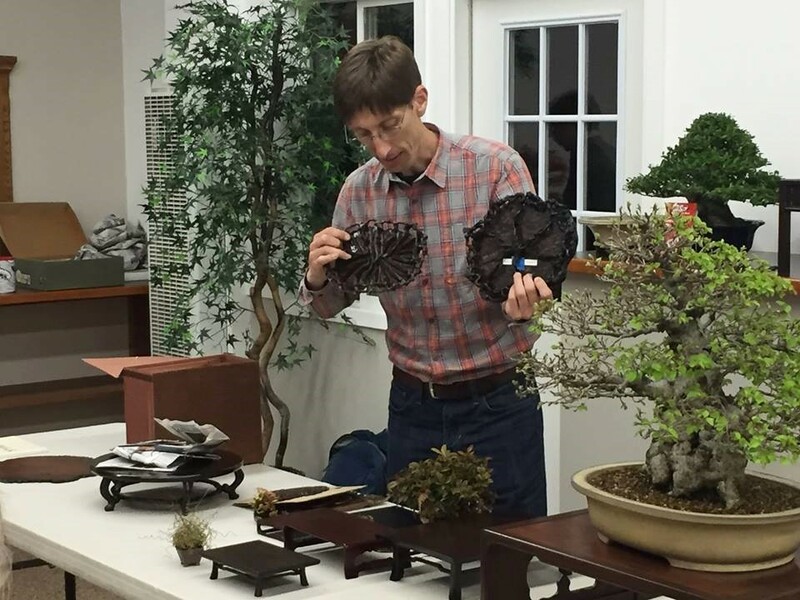 It is important to grasp the concept of formality in bonsai displays because many of the decisions are based on formality. For instance, the main tree in a multi-point display should be placed on the most formal stand. Some factors that increase the formality of stands are darkness, detail, and height. Even the type of wood is important, with bamboo being the least formal stand material. 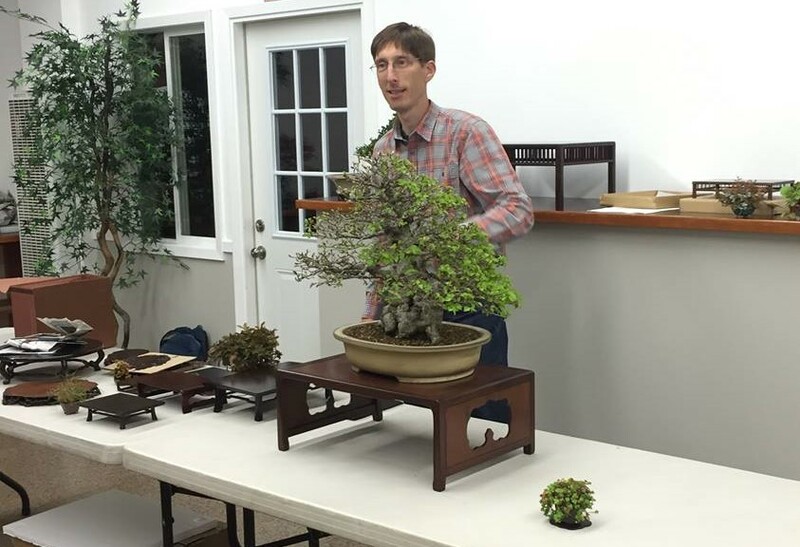 Another valuable point Jonas made was the importance of establishing context within your bonsai displays. The scroll and accent plants in a display are particularly important in establishing both the location and season the artist wishes to convey. Fall colors in accent plants naturally give an autumnal feel, whereas vibrant green and brightly colored accents will bring an air of spring. A scroll with ocean waves and an accent plant with tall, leaning grass might establish a seaside setting. The possibilities are limited only by the artist’s imagination. At the end of the night, several club members won some very nice display-related items that were raffled off, and everybody perused the beautiful Japanese items Jonas has begun to import for sale. It was a well-rounded evening.